Gladstone Burgerville follows 92nd/Powell location in joining Burgerville Workers Union, first fast-food union in U.S.
Last weekend employees at the Gladstone Burgerville voted to join the the Industrial Workers of the World's Portland Chapter. The election was the second successful fast-food unionization ever overseen by facilitators from the National Labor Relations Board. 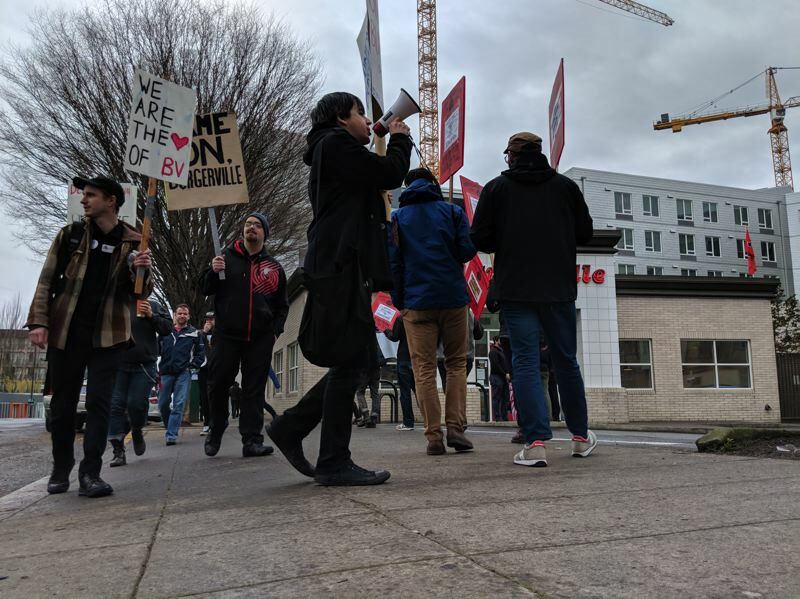 On April 23, Burgerville workers at the Southeast 92nd Avenue and Powell Boulevard location voted to recognize the Burgerville Workers Union (BVWU). The votes mean Burgerville is now legally obliged to negotiate with staff at the two stores. BVWU, launched in April 2016, demand a $5 pay raise, an end to Burgerville's voluntary use of e-verify, consistent scheduling and affordable health care. The union has an active presence in six stores. The fast-food firm has 42 locations throughout Oregon and Southwest Washington and over 1,500 employees. Burgerville hired PR firm Weinstein Public Relations on April 1. The company, which has denied harassing union organizers, said it supports the moves to unionize. "Burgerville is a progressive, pro-employee company," said Beth Brewer, senior vice president of operations for Burgerville. "We have supported our employees with the freedom to educate themselves about the options of joining a union." According to the company, Burgerville employees are already paid nearly 20 percent more than industry standard and are offered health insurance starting at $35/month.